Given the significance of Alex Rodriguez’s 600th Home Run, and the potential resale value of the ball, we at SeatGeek became particularly interested in where A-Rod’s 600th ball will land. As background to the story, SeatGeek.com is the only site that forecasts how sports and concert ticket prices move on the secondary ticket market and it allows fans to search multiple sites, discover ticket deals, and find sold out tickets. We teamed up with Hit Tracker, a company that tracks the trajectory of Major League Baseball home runs, to determine the section and actual seat in Yankee Stadium where Alex Rodriguez is most likely to hit his 600th homer. SeatGeek also monitored Yankees ticket prices on the secondary market for sections that have the highest probability of being the landing zone for #600. 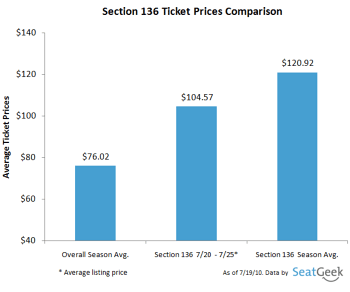 We compared these prices with average transaction prices of these seats throughout the season to measure expected return-on-investment (ROI) for the tickets purchased. Russ D'Souza, Co-Founder of SeatGeek, stated "No other company has SeatGeek's unique data and it was great to team up with HitTracker.com to use this data in a new and exciting manner". This chart lists the probability that the historic home run will be hit into certain sections of Yankee Stadium. Also with the help of Hittracker, we were able to determine that Section 135, Row 18, Seat 6 (“The Money Seat”), is the seat that the ball is most likely to land. So, what if you want a ticket in one of those sections that the ball is most probable to land? 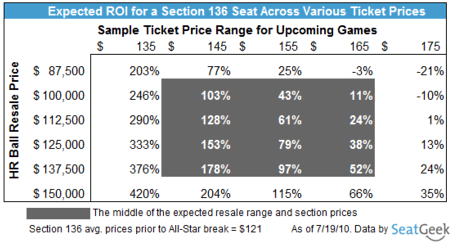 Well it is going to cost you considerably more the Yankee’s average ticket transaction price for the season, as you can see in the chart to the right. The lucky person who is able to nab this historic home run, however, could be in for a huge payday if they decide to sell the ball. 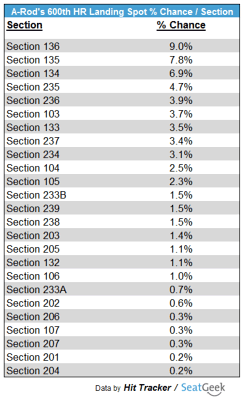 The table below illustrates ROI based on the price paid for the ticket in section 136 and the amount the ball might sell for. Sample calculation: 9% chance for section 136 / 184 seats in section 136 x $125,000 resale price of the ball = $61.14 expected gain. $155 ticket price – $120.92 section average prior to break = $34.08 incremental spend. $61.14 expected gain – $34.08 cost = $27.06. $27.06/$34.08 = Expected Value ROI of 79%. Realized ROI = ($125,000 – $155) / $155 = 80,545%. If you are attending a Yankees game during August, we wish you the best of luck in your efforts in catching A-Rod's 600th home run.